Measurements: 3.15 x 4.25 inches, or 80 x 118 mm. Back of card: A right mess. A Tree of Life in the center, flanked with the pillars of Gemini (Castor & Pollux, as sometimes seen flanking The High Priestess). A riot of colors: blue, green, white, black, red, orange, with nine smaller colored circles, three on each pillar/tree. Not for inversion, which won't bother you nearly as much as the fact that you cannot casually tell if the cards are right-side up, or upside down. Booklet included: Yes, 24 pages, 2.85 x 4.1 inches, or 71 x 103 mm. Comments: I am embarrassed to say I have had this deck in stock since 2000, but overlooked it. Only now (June, 2005) has it been "found" and put on-line. Apologies to those of you who missed it. The Gill Tarot is based on the Kabbalistic Tree of Life. And though many decks claim their cards are "intuitive" and "speak directly to the reader", this is one of the few times I would agree. For the most part, these are bold, simple designs. 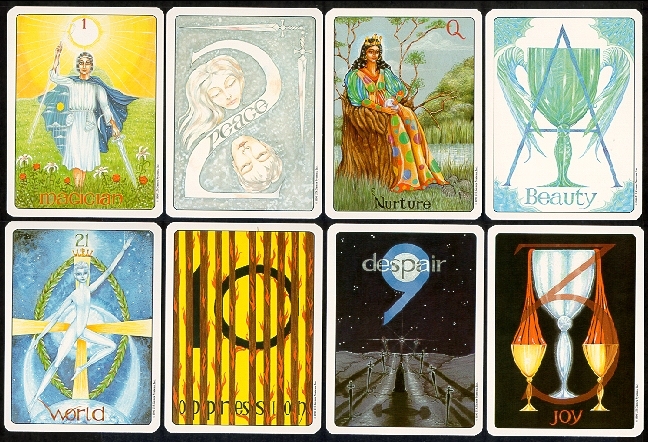 Although there are only 78 cards to a tarot deck, every deck actually has two more, for a total of 80. In this deck, the two extra cards are pressed into service. One of them is called The Presentation Card & shows the ideal person & his relation to the cosmos. The other diagrams a 10 card Tree of Life card layout.